Southern sophomore Jordan Hardwick (11) attempts a spike during the Lady Tornadoes’ sectional final setback on Thursday in Waterford, Ohio. WATERFORD, Ohio — Alas, the third time wasn’t the charm. 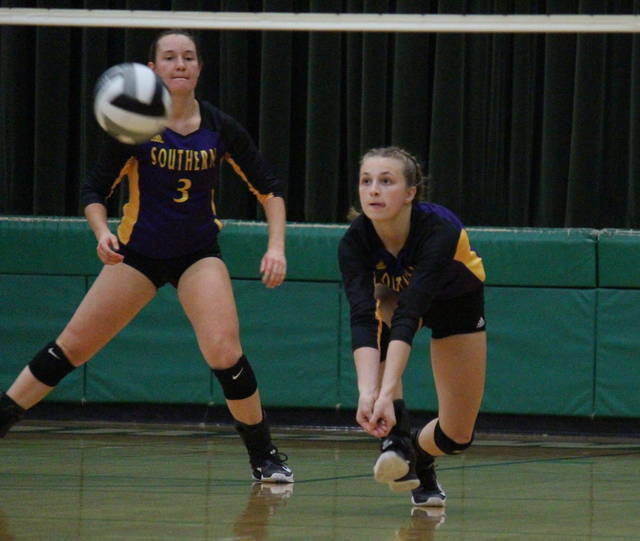 The Southern volleyball team — which fell to Tri-Valley Conference Hocking Division champion Waterford twice in the regular season — fell to the Lady Wildcats again in Thursday’s Division IV sectional final inside Harry Cooper Annex in Washington County, with the top-seeded hosts taking a straight games win over the No. 9 Lady Tornadoes. Southern (6-16) led 1-0 in the first set, but the Lady Wildcats (18-5) scored the next five points and never looked back en route to a 25-10 win. 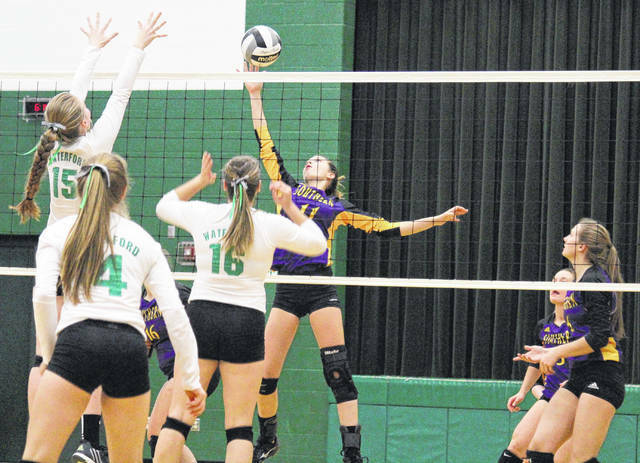 The Purple and Gold also led 1-0 in Game 2, but Waterford scored the next two points and didn’t trail again on its way to another 25-10 victory. The Green and White led initially in the third game, but Southern fought back to take the advantage at 8-7. Waterford claimed the next two points, but the Lady Tornadoes were back in front at 10-9. The Lady Wildcats then earned two of the next three points, leaving the teams tied at 11. From there, Waterford scored 10 in an row and cruised to the match-clinching 25-18 victory. In the win, the Lady Wildcats earned a 62.5-to-31.5 advantage in side-out percentage, to go with a 40-to-30 edge in digs. Southern had five aces and a 90.0 serve percentage, while WHS finished with 11 aces and a 95.9 serve percentage. The Lady Tornadoes’ 11 kills led to a 5.3 hitting percentage, while Waterford picked up 33 kills and a 25.8 hitting percentage. 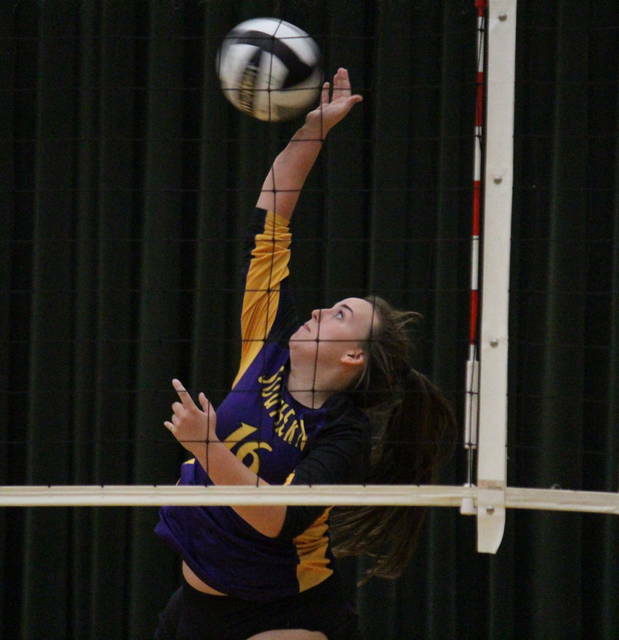 SHS senior Baylee Grueser led the Lady Tornadoes with five service points, including a team-best two aces. Sydney Adams and Baylee Wolfe had three points and an ace apiece, while Phoenix Cleland finished with two points and an ace. Kassie Barton and Peyton Anderson rounded out the SHS service attack with a point apiece. Wolfe paced Southern at the net with six kills and a block. Adams, Cleland, Jordan Hardwick, Saelym Larsen and Abby Cummins each had a kill for the Purple and Gold, with Cummins and Marissa Brooker each earning a block. Adams had a team-best seven assists for Southern, while Cleland led the defense with eight digs. Waterford’s service was led by Cara Taylor with 14 points and an ace, and Ana-Sophia Beardsley with 12 points and a match-best six aces. Beth Dawson had eight points and two aces for the victors, Haley Klintworth added seven points, while Allex Teters posted five points and two aces. Odessa Tornes and Riley Schweikert rounded out the WHS service with three points and one point respectively. 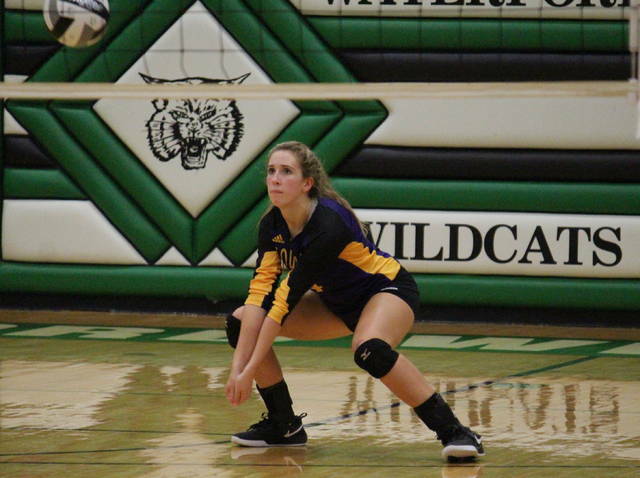 Teters led WHS at the net with 13 kills, followed by Beardsley with seven kills and a block. Schweikert and Denise Young had four kills apiece, with Young earning a match-best three blocks. Lily Roberts had three kills and two blocks for the hosts, while Taylor added two kills and a team-high 24 assists. 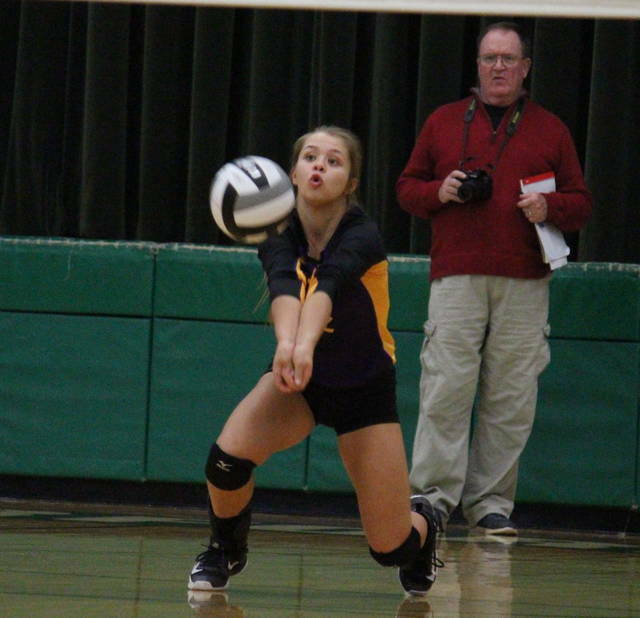 Klintworth led the Waterford defense with 14 digs. This marks the final game in the Purple and Gold for seniors Peyton Anderson, Marissa Brooker, Abby Cummins and Baylee Grueser. Third-year Southern head coach Kim Hupp noted how much the team will miss their senior quartet. Waterford advances to its 11th consecutive district tournament, in which the Lady Wildcats will face fifth-seeded Paint Valley at 6 p.m. on Thursday at Jackson.